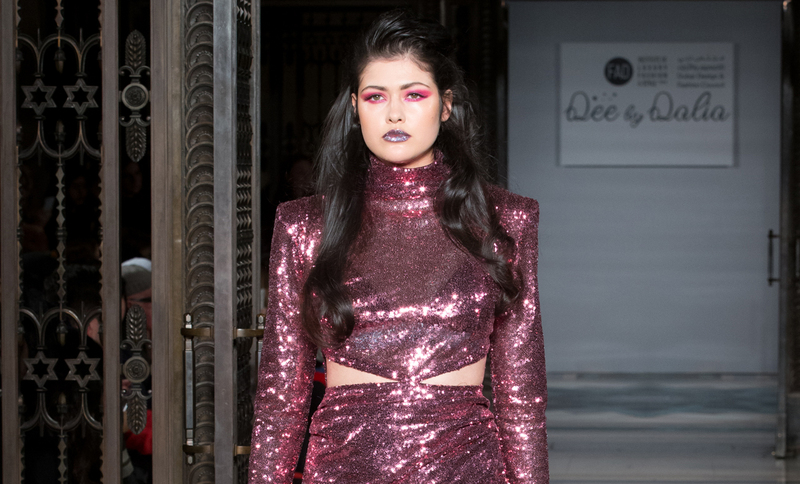 Making her fashion week debut, Dalia El Ali’s ‘Sirius’ collection rocketed onto the catwalk with all the galactic glamour of someone who’d been doing it for years. I knew little about her collection when I took my place in Freemason’s Hall, but MY GOD had I stood up and taken notice by the time that first look hit the catwalk. The designer, who grew up in the UAE, only completed studying at London College of Fashion in 2013 and has been picking up starry-eyed fans ever since. And if you’re wondering, why all the space puns; hold on, we are going somewhere with this. The collection was inspired by astronomy, female empowerment, and a sprinkling of positive energy, which shone through each enchanting constellation print that floated through the hall. From the galactic patterning and embroidery, to the styling, hair and makeup, the looks were strong and beautiful, with embroidered #metoo hashtags also sneaking their way into designs, in a wonderfully poignant nod to the strength of women. With rich blues, pinks, purples, bold shoulders and metallics lighting up the venue, it looks like you can’t go wrong channeling space-like hues with a bit of sparkle going into Autumn. And if I don’t get my hands on a corseted mesh dress by September, I will ugly cry.